St. Patrick’s Day is right around the corner. It’s time to break out all the green and make your Leprechaun traps (Stella has her’s ready to go). I like to build up to my traditional corned beef and cabbage dinner with other Irish themed meals. The other day we had Bangers and Mash, Maizie was a bit hesitant because of the name, bit once she tried it, she couldn’t get enough. 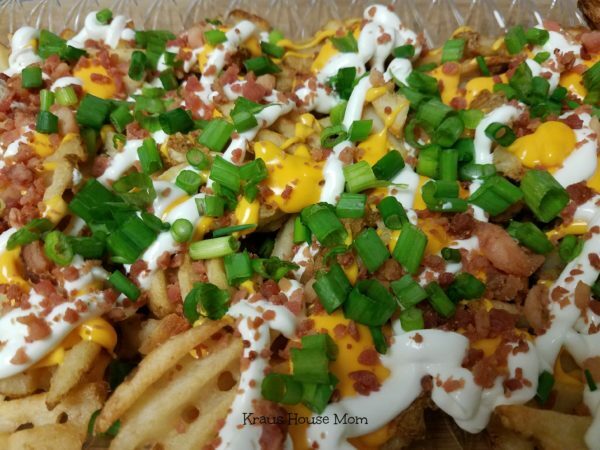 One of my family’s favorites is Irish Nachos. They are delicious and so easy to make. I call them Irish Nachos, but these don’t have be be just for March. We ate them while watching the Super Bowl or when one of the kids requests them. When we have them for dinner, we pair them up with corned beef sandwiches, if your’re going Irish, you should just go all the way. Nachos aren't just for chips. Throw on some green and give these a try. 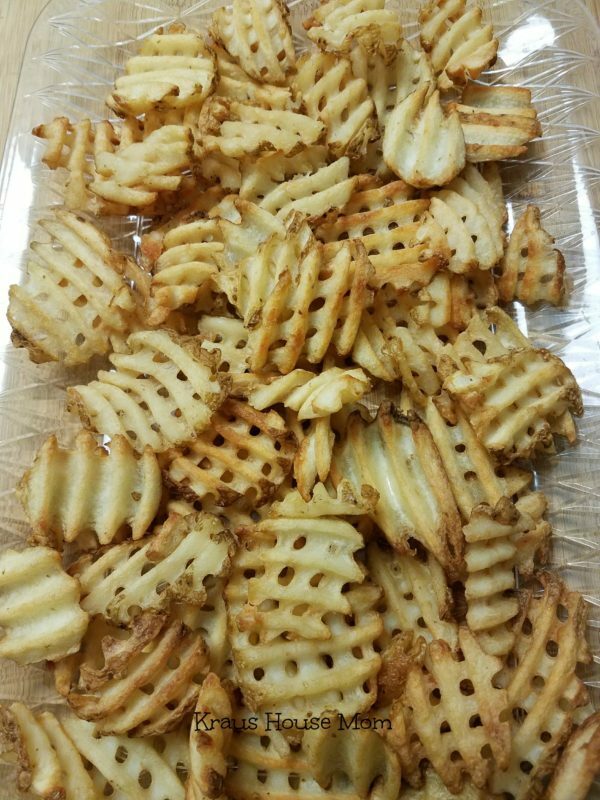 Arrange cooked waffle fries on a plate or platter. 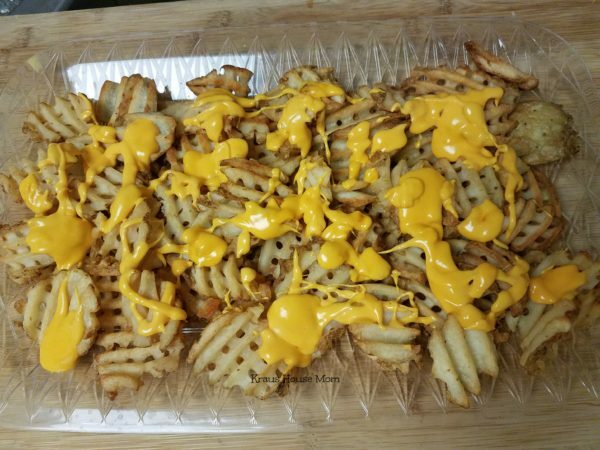 Pour nacho cheese evenly over the waffle fries. I love the idea of using waffle fries in place of tortilla chips. My entire family would love your version of nachos. Looks delicious! Nachos are a favorite here and these sound great. I prefer nachos with potatoes over chips. I love your idea to use waffle fries. Love the waffle fries. Fun idea making different Irish dishes. Break out the scones and Irish Stew. Yes please! I would just love these Irish Nachos. I tend to love regular nachos, so I know I’d enjoy these. Yum! I haven’t used waffle cut fries but we do use regular french fries to make these. I really like it better since the chips can get too soggy. I am sold! This dish looks so good and it’s definitely something that I would make to treat my husband and I to some comfort food. It’s great for movie night as well. I’ve seen these made with tater tots but I love the waffle fries take on this recipe. I have some sweet potato waffle fries in the freezer so I may just make these this weekend. Yummy! These look really good! I’ve never seen something like this but I like St. Patrick’s Day so maybe I’ll make them next weekend! I will not wait for St. Patrick’s day to make this. Tomorrow is the day! This would be the perfect snack for our family movie night! We love waffle fries! 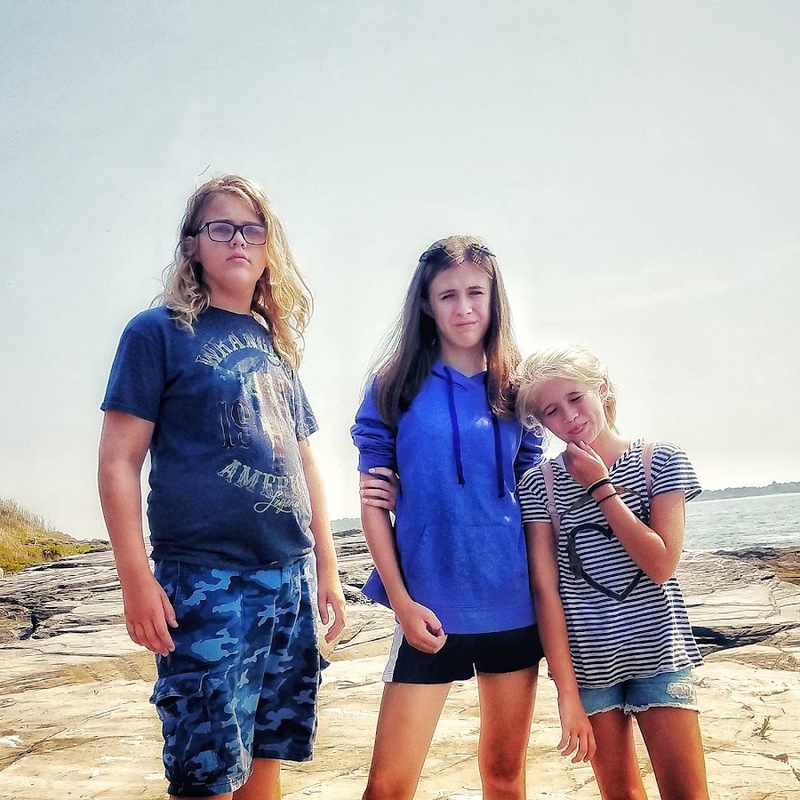 (I posted a recipe today with them as the star!) These look so good! I actually have a bag in the freezer, and all the stuff to make this. 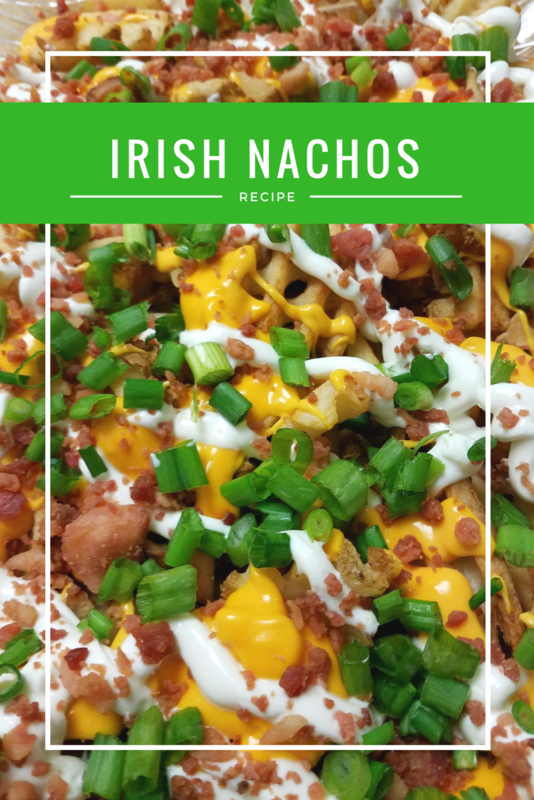 Wow I never heard of irish nachos but these look delicious. I love the idea of using waffle fries as the base. Now this is something I could get into! I love this recipe; all of it! I am pretty sure this is my spirit food. I could seriously live off of this. I’m drooling! I’m a cheesy person and this dish will certainly delight my taste buds. It looks very attractive too because of the scallions! I haven’t had Irish nachos since I managed an authentic Irish pub in Toronto. So good and tasty! That looks so good! I love french fries and cheese. I haven’t heard of these before! They look delicious though would love to give them a try! These look like they are bursting with flavor! I would love to try this sometime soon! Our family LOOOOOVES Irish Nachos! So yummy! Aha, you just gave me a brilliant idea what to make. We love waffle fries and this dish is perfect. We are all about holidays over here. St. Patrick’s Day is always a fun one. 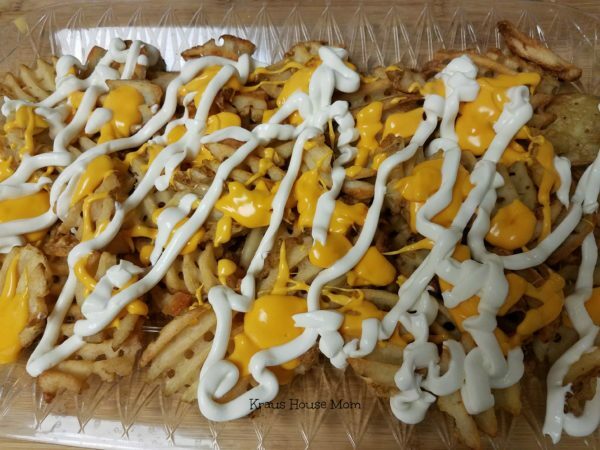 Need to try these nachos because how can you go wrong when waffle fries are involved? Wow! These nachos look great!! I would definitely try these out for a quick dinner. This Irish Nachos recipe seems really easy to do. It’s perfect for St. Patrick’s Day! What an amazing idea! So fun for St. Patricks day! I’ll bookmark this. Thanks! I am down for Irish Nachos. I really enjoy waffle fries so this would be good for me to indulge in. Irish nachos! Thet look delicious and I know that my boys would love them! Thank you for sharing this – I’m bookmarking for the weekend! These look delicious and perfect for St. Patrick’s. I am totally making these, they sound incredible. Nachos are one of our favorite snacks. These look like they would be perfect for the holiday!